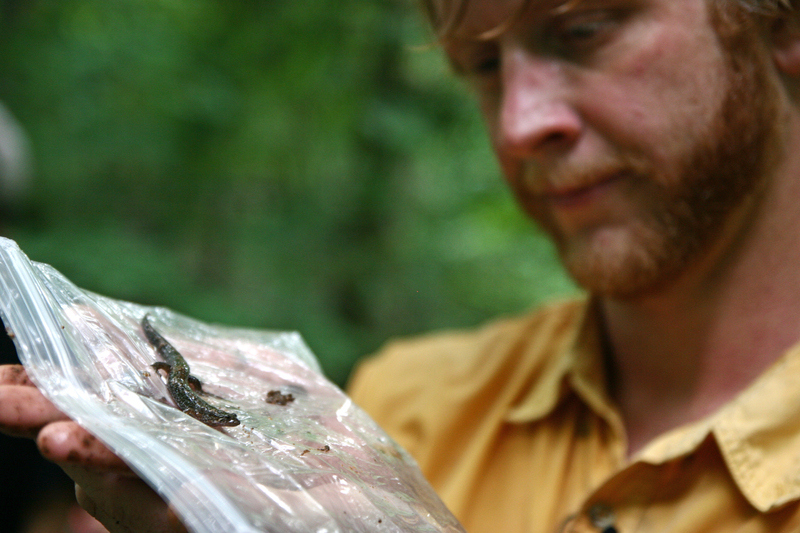 Veterinary student Zachary Chillag examines a dusky salamander during a reptile hunt at the State Botanical Garden of Georgia (Credit: Sue Myers Smith/UGA). Athens, Ga. – For those clamoring for a closer look inside the University of Georgia College of Veterinary Medicine, tune in to WUGA-TV for “Veterinary Spectrum,” which airs during December, January and February. The six shows include a mix of interviews and individual story segments that explore the various programs, outreach and research work done by the faculty, students and staff in the college. Each show also includes a segment on wellness care for animals. “These shows highlight the entire breadth of our profession: from regenerative therapies for horses to care of older animals to nutrition to emerging diseases in bats. We hope ‘Veterinary Spectrum’ will help people see all that we do and also encourage younger people to consider a career in veterinary medicine,” said K. Paige Carmichael, host of the show and associate dean of academic affairs in the college. Other show topics include the “Vets for Pets and People” outreach program, which offers foster care to animals that belong to victims of domestic violence; the veterinarian’s role in creating a safer food supply both in the U.S and abroad; the role of cortisol in critically ill foals and how that relates to human infants; polio vaccine research and why polio is still a threat in today’s global society; parasitic resistance to drugs in livestock and dogs; animal paleopathology and what can be learned when veterinary paleopathologists partner with archaeologists for research; a reptile hunt at the State Botanical Garden of Georgia; how veterinary researchers are working with educators to change the way science is taught to kindergarteners through 12th graders; and the assembly of a Sumatran tiger skeleton. “Veterinary Spectrum” was funded by a grant from Nestlé Purina. For show dates and times, see www.wugatv.org. WUGA-TV is operated by UGA in partnership with Georgia Public Broadcasting. Funding for WUGA-TV and its affiliated radio station WUGA-FM is provided in part through sponsorships, underwriting and listener contributions. The UGA College of Veterinary Medicine, founded in 1946, is dedicated to training future veterinarians, conducting research related to animal and human diseases and providing veterinary services for animals and their owners. Research efforts are aimed at enhancing the quality of life for animals and people, improving the productivity of poultry and livestock and preserving a healthy interface between wildlife and people in the environment they share. The college enrolls 102 students each fall out of more than 800 who apply. For more information, see www.vet.uga.edu. The current UGA College of Veterinary Medicine Teaching Hospital, built in 1979, serves more than 18,000 patients per year in one of the smallest teaching hospitals in the U.S. The college is currently working to raise $25 million toward building a new veterinary medical learning center, which will include a new teaching hospital as well as classrooms and laboratories that will allow for the education of more veterinarians. For more information, see www.vet.uga.edu/vmlc.